When I tell people I offer cat grooming, their eyes widen. They scan my hands and arms, searching for battle scars. Next comes the shudder and the comment on how brave I am, secretly thinking that I must be nuts. Maybe a bit crazy, maybe I’m an adrenaline junkie. Okay I am an adrenaline junkie. Whatever the reason, I love grooming and styling the purring, spitting rag a muffins. Regular grooming can prevent this. Contrary to popular belief, most felines enjoy being styled. I know, it sounds insane; I am still amazed by the fur balls. We tend to pigeon-hole our feline friends into the slash and gnash category and I think many of us have a hidden fear of being raked over the coals by our feline house guests, but, honestly, they are amazing at being groomed. Cats are very tactile animals; they sense much of their environment through touch. 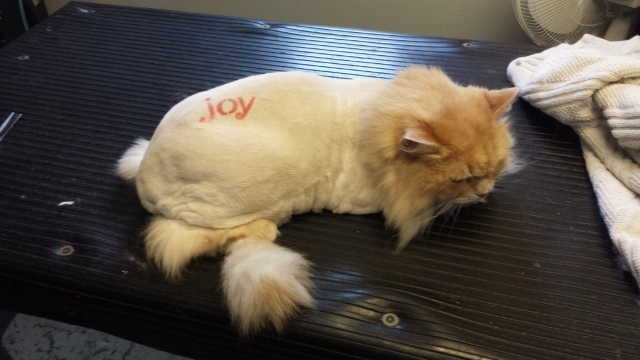 Vibrating clippers on their back, removing a painful matt…well…I`m sure some felines would describe it as ecstasy. After the matted fur is removed, they can actually feel the world around them, rub themselves without the matts catching and pulling their skin. Some are lazy groomers, the older ones sleep rather than clean themselves, (they tend to let themselves go), and many are just too fat to fold themselves to reach and groom. Many of the long haired ones, get over whelmed and can`t keep up. Grooming helps them keep on top of their needs. 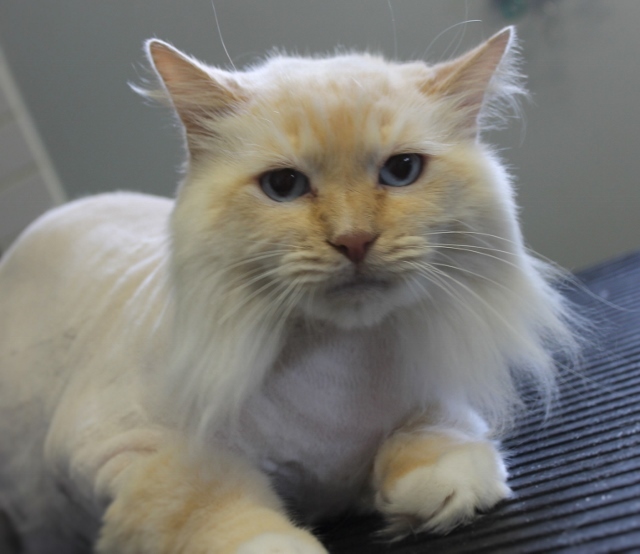 A few of my clients shave their fur balls because of allergy issues in the house. It seems to help the one who is allergic. As soon as they start stuffing up, time to shave fluffy. 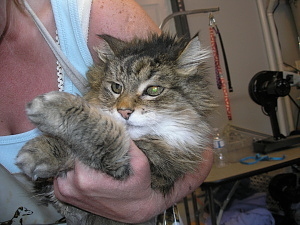 I prefer them not tranquilized, as many times the tranquilizer won`t take full effect until the grooming is finished. 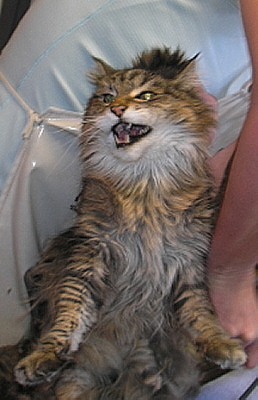 Kitties have about twenty to thirty minutes of patience during grooming. Because of the quality of equipment I use, I can shave a kitty in an average of twenty minutes. A full groom including a bath and dry takes an hour. NOTE: if your cat is stressing to the point where I am in danger of getting severely attacked, the groom stops. I will not put myself in danger from a severe attack. I expect to get scratched; however, I’m not prepared to wind up in the hospital. Some will have to go to the vet for shaving. You are more than welcome to stay to watch and I may need an extra hand to hold a tail up. Dogs are generally better without the owner present, cats, it makes no difference. Don’t be disappointed if your slasher doesn’t explode. Most owners are surprised at how well their fur ball accepts grooming. 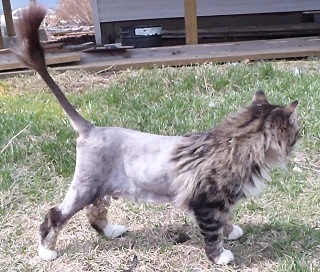 I offer a variety of styles…the Full lion; all the hair from the shoulders forward is left on. Mini lion: a mane around the neck cascading down the chest (if possible). Lynx: The body is shaved. a mane on the neck can be left or it can be shaved to the base of the skull. The throat is shaved up to the chin, with the cheeks left long. Bobcat:The bobcat is the same as a lynx, but the cheek fur is shorter. Puss in Boots can be done with any of the body styles above (depending on how the cat is during grooming). Boots on the legs can be long pirate boots where the shoulders and front leg is left furry. Tall boots, the front leg is left furry or short boots where the leg is shaved to the first joint above the foot (the ankle). 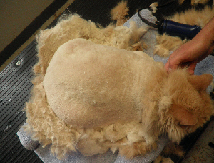 The rear legs are shaved with the bottom of the leg left furry. 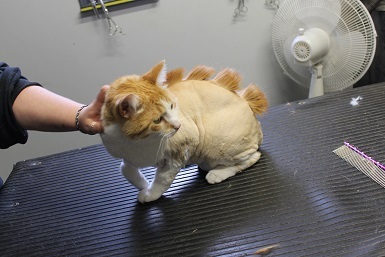 And just for fun, you can turn your kitty into a Catosaurus! Tails can be left full, styled as a lion tail: shaved with a little puff on the end, or a panther tail: completely shaved. Corkscrew tail is shaving rings around the tail leaving alternating shave, furred pattern. One of the personality quirks, that all owners will agree with, is cats are very vain. They don`t like being matted or dirty. And they don`t like being laughed at. 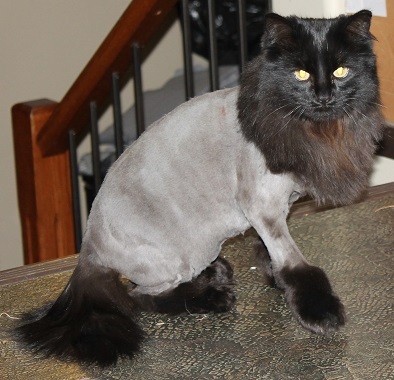 The worst possible thing that you can do is laugh at the at your house lion after they have been styled. If they don`t feel good about it, every groom after will be more difficult. This brings us to lightning bolts. 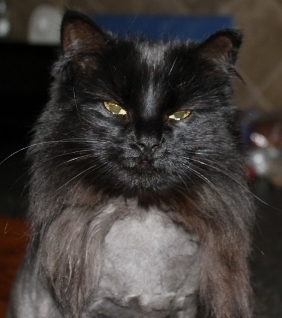 I started shaving lightning bolts into the sides of the purring felines to prevent them from being laughed at. It works, instead of getting laughed at, people think it`s cool that the fancy feline is sporting a design in his side. 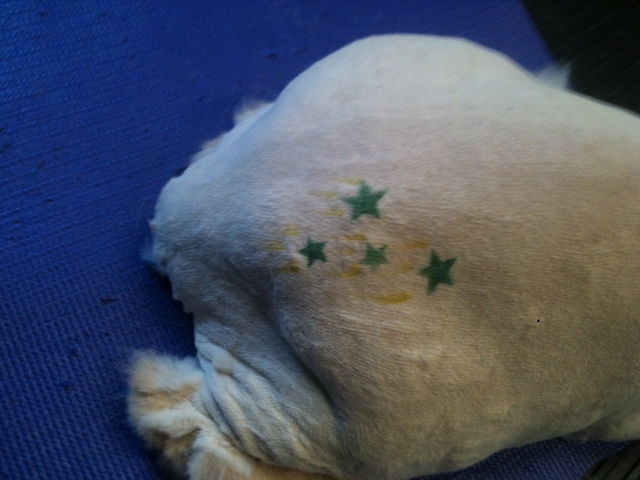 Stenciling can also be done as can coloring the puff at the end of a tail. Adding a design, strokes the vanity of cats making each groom after easier. 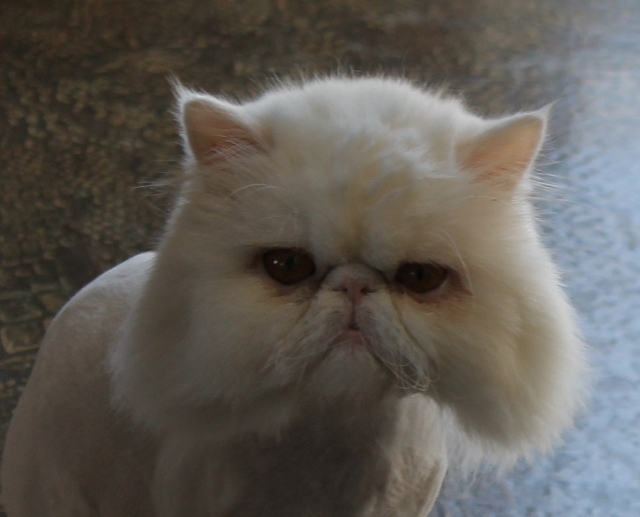 Of course depending on how the kitty is handling a groom dictates the style and design we can do. If a cat is overly stressed and is slashing, my main concern is to shave off the matts. Remember, we are working in a very small window of time. If you want short boots, it may not be possible until a second or third groom. I want your kitty to be comfortable and work with the time they can give me. The amount of matting will also determine the style. 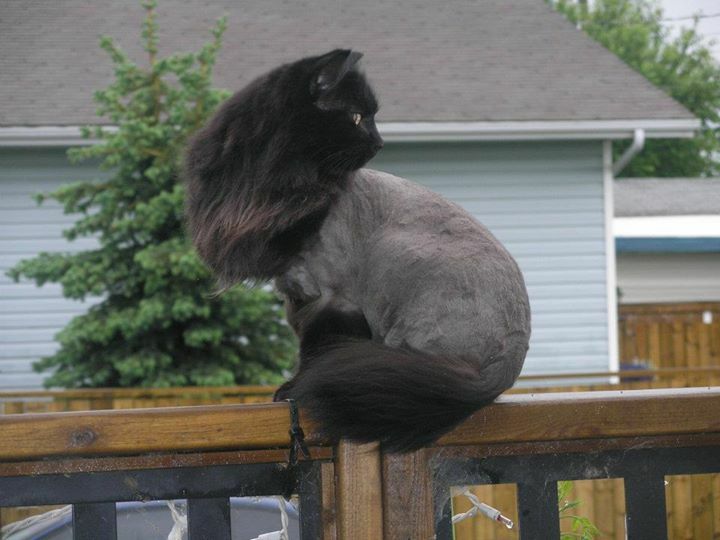 If puss puss is matted from head to tail, it`ll be a panther cut. A lion just won`t be possible. If there was severe matting to the point where the skin is raw, avoid any heavy petting. Allow your fur ball to set the pace and pressure of petting. His skin is very sensitive and sore. If you have a partner that continually laughs, calls him/her funny looking, stupid or any variety of names…get a new partner.